Patch 4.1 is the first major content patch of the Cataclysm expansion. The Public Test Realms for it came up on February 24th, 2011. This guide contains everything you need to know about the patch! Precious little is known at the moment, but stay tuned for updates as our testers and dataminers alike dig up interesting tidbits about the future! Dungeons - Everything you need to know about the former troll raids, now 5-man Heroics, Zul'Aman and Zul'Gurub. Quests - Wait... how is this happening? These quests will explain it for you! Guilds - Exciting updates to guild features, such as Guild Challenges! User Interface - There will be numerous revamps to different UI aspects. Miscellaneous - New quest chains, emerging factions, and interesting items lurk here. Maps - TBC dungeons and raids have received maps! 3D Models - New models have been unearthed by the new patch. Come check them out! Icons - There are also a multitude of fancy fiery and troll-ish icons! Patch Notes - Acquaint yourselves with everything that is official about the new patch. Helpful Links - A repository for useful blogs, sites, and tools regarding the new patch. In this patch, the former raids will return as heroic-only dungeons revamped for level 85 players! Prepare yourselves to combat the fatal Zandalari plan to reunite the troll tribes, and fight the chaos in Stranglethorn Vale! The new dungeons will feature pre-raid loot as well as remakes of the famed tiger, raptor and bear mounts! Read more on our Dungeons and Quests pages! The guild finder makes an appearance, relieving new players from the painful process of finding guilds. You can now look for guilds that have the same interests as you do, and you will no longer have to peruse the trade channel! Another new feature are guild challenges, which reward your guild more experience. The challenges are weekly objectives for guilds that include completing dungeon runs, killing raid bosses and winning battlegrounds. Read more on our Guilds page! We also will have several revamps and additions to the user interface, most notable of them being the looking for dungeon change. Instead of accumulating points on a per-day basis, you get to spread out your 7 dungeon runs over an entire week, and still get the same amount. To help with queuing times, the Dungeon Finder will attempt to reward players that fill an in-demand role. The help and knowledge base will also receive a major graphical overhaul, streamlining options to report issues, look for existing problems and, well, anything that belongs to bugs. Read more on our User Interface page! The grind for Reins of the Winterspring Frostsaber will no longer be done via a tedious reputation grind, but instead through a quest line similar to how Horde players obtain their Whistle of the Venomhide Ravasaur. New subzones have been added! Check out Old Ironforge below the mountain, and the goblin resort town in Feralas! Read more on our Miscellaneous page! Several new icons and models tied to Firelands in patch 4.2 are in patch 4.1's files already! All of the TBC dungeons and raids will receive maps! 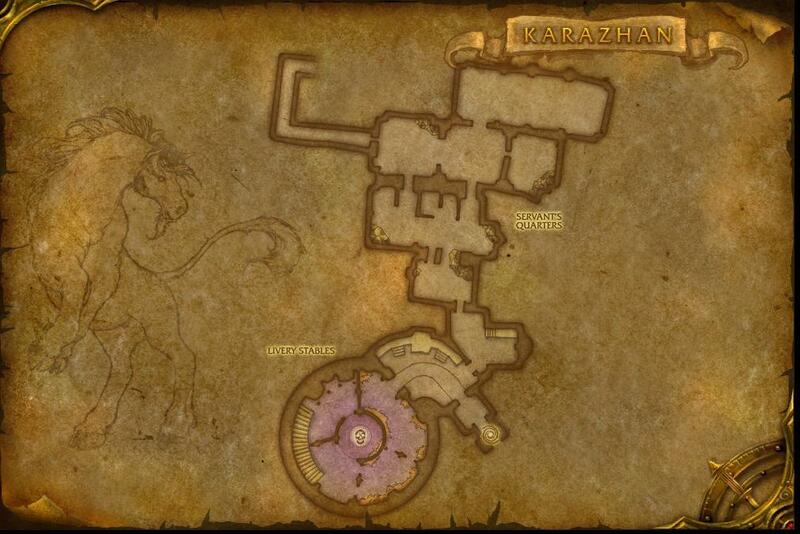 Did you forget how big Karazhan was? Read more on our Maps, 3D Models and Icons pages!